Every year you’re inundated with holiday cards that include snapshots of smiling friends and family members. Why not return the favor? 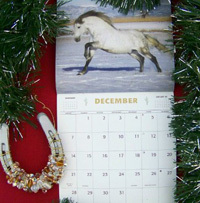 Tuck a photograph of you alongside your favorite horse into holiday cards and correspondence. The holiday countdown has officially started, so now’s the time to arrange a photo session. To make the picture extra festive, braid a bit of ribbon into your horse’s forelock or tie some tinsel on the bridle. Then shuffle through your closet and dredge up your traditional holiday sweater. And don’t forget to smile! this is exactly what i did, a picture of me and buddy along with a little short note on his progress on his training….